Building a life with your romantic partner can be enormously gratifying, but what if your lover is also your best friend… and your business partner? We understand this rare situation completely: it's what we live every day, as photographers who've been married and best friends for most of our adult lives. This couple has a successful private medical practice in South Florida, where they work together day in and day out; they are also raising a beautiful family together, spend every moment together, and smile more than anyone we've ever met. We don't ask people to smile very often, since natural smiles are always best, but these two have almost no ability to hold a straight face for more than a moment because they're so deliriously happy with each other. Choosing to have their celebration at Disney World in Orlando, Florida was the perfect decision: Disney weddings are by their very nature the happiest on earth, and being a Disney wedding photographer (at least for one weekend) kept us flying high on the happiness ride along with everyone else in attendance. 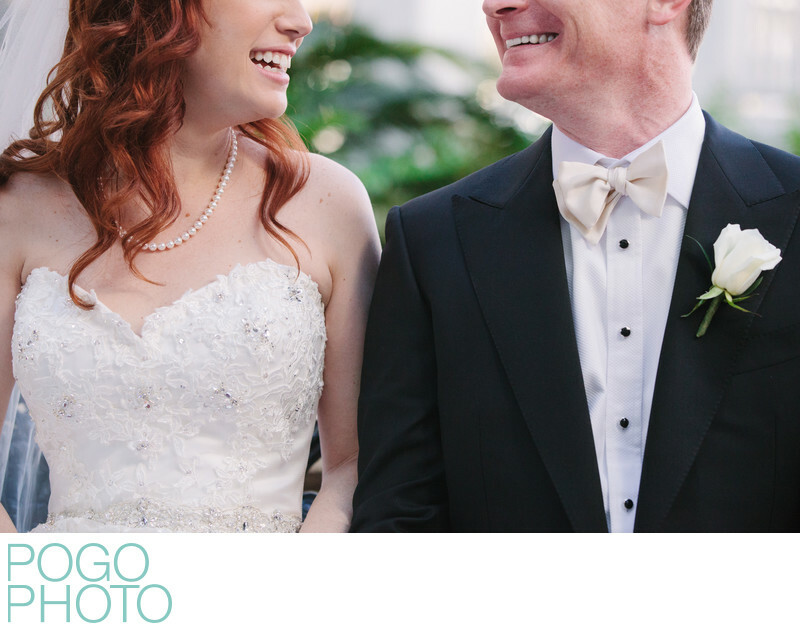 Choosing to cut off the tops of their heads was deliberate; it draws attention to the extreme contrast between the bride's curves of her dress, necklace, and curling hair, and the groom's pointed details in his jacket and bowtie. The bride's red hair brings a pop of color to the image that contrasts beautifully with the greenery in the background, reminding us that a February wedding in Central Florida isn't really winter. Location: Grand Floridian Resort & Spa, 4401 Floridian Way, Bay Lake, Florida 34747. 1/400; f/4.0; ISO 2500; 100.0 mm.